Google+ has a new feature rolling out that allows you to quickly see how posts you have made are being received. Called Your Influence, it is found on your Google+ profile next to the About button. There you will find an overflow menu (the three vertical dots) which you can tap and then see your stats. 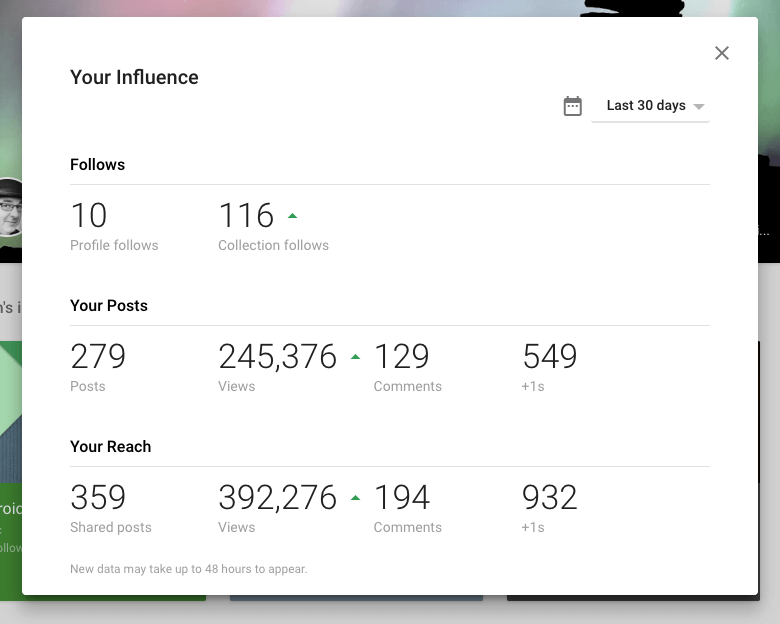 The stats can be viewed for the last 7 days or the last 30 days and give you a lot of information about how many new followers you have, how many new collection followers you have for your collections and the influence of your posts. The feature is rolling out now so it make take a few more hours for everyone to see it. have received for your posts. Likewise, you can see your reach in Your Influence. You can see the number of posts you have made have been shared, the views those shares have received, comments and +1s. The real question here however is… do you care? As one who has run a blog for 12 years, analytics are important yes but measuring influence simply by numbers is a bit tricky. Just because someone +1s something, is it because they really found it valuable or simply being nice? It is hard to say and likely there is no 100% correct answer or measure. Regardless, if you want to see your influence numbers, go to plus.google.com/me and look for the overflow menu next to the About button. Note that you have to visit the site as this feature is not in the Android Google+ app – at least not yet.